Although tuners are not amongst the most glamorous accessories for musical instruments, they are useful for all musicians. We cannot think of something worse than playing out of tune or time, so it’s mandatory to purchase the right type of tuner for your electric instrument. If you’re a newbie in the field or didn’t come across this problem before, the following article will come in handy. Below you can find a guide with the most popular types of tuners and the reasons why some of them may work better than others. An electronic tuner is a device used for detecting and displaying the pitch of musical notes played on an instrument. The pitch is usually measured in Hertz, and it represents the lowness or the highness of a musical note. The simplest tuners use LEDs, LCD screens or an analog needle-dial to determine whether the pitch of your instrument is lower or higher than the one you need. These devices vary in size, shape, and functions so finding the right one for your instrument may not be the easiest job. 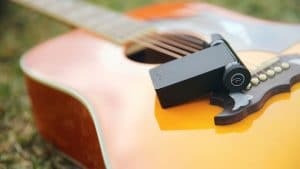 Some instrument technicians may need expensive and accurate devices, while beginner musicians can stick to regular, market tuners. Most of the time, regular tuners will only detect and display the tuning for a single pitch, usually “A” or “E.” Other products can detect up to six pitches, the common ones used for tuning a standard electric guitar. Professional devices come with additional functions and features that musicians can benefit from, including chromatic tuning for up to 12 pitches, pitch calibration or adjustable “read-time” settings. These devices became extremely popular in the 1970s because they were smaller, price-convenient, and lightweight. They were easier to use than regular tuners and, soon after, handheld tuners divided into two major categories – electric and acoustic. Those designed for electric instruments featured a standard jack connection, while those for acoustic instruments came with a built-in microphone. 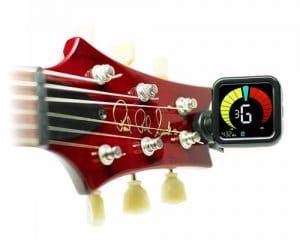 These tuners are by far the most convenient option to always keep your instrument in tune. Depending on the type of instrument used, they can be attached to various parts, such as onto the bell of a trombone or the headstock of a guitar. Once attached to a device, the clip-on tuner senses the vibrations from the instrument, helping you find the perfect pitch for your song. Since there isn’t any microphone attached, these tuners can be used in the loudest environments without hearing any background noises. Moreover, you can choose to tune your instrument at the same time with other musicians, without interfering. Depending on the brand and the model, clip-on tuners come with prolonged battery life and an adjustable screen so you can easily read it. Chromatic tuners allow a wide variety of instruments to be tuned to all 12 pitches of the scale. They can also be used to tune acoustic instruments as long as they come with a microphone to detect the sound. Depending on their price, these items are equipped with numerous features. Some of them are even optimized for certain instruments or family instruments like the guitar. These devices are pretty accurate, and they deal with the tuning in a chromatic matter. They are user-friendly and anyone can benefit from them, including newbies. The display is visible in all lighting conditions, even when it’s dark in the room. Some items come with separate jacks for input and output. The tuner is built into a case that is placed at your feet, making it easy to reach when you’re on stage and have both your hands busy. The displays on the pedal tuners are designed to be convenient to read in all lighting conditions. They are mainly intended for professional musicians, and their precision is highly appreciated by those playing acoustic or electric guitars alike. A high-quality pedal tuner will come with a better output and will help you perform better on stage. You can also use the device as a switcher and even to redirect the signal via an amplifier. Strobe tuners are the most accurate you’ll find on the market today and some of the oldest too. The first one was invented more than 80 years ago, in 1936. It was named Stroboconn and was produced for 40 years. The updated versions of the strobe tuners are designed to show the difference between a reference frequency and a specific musical note that is being played. The mechanism behind the technology is quite complicated, but you need to know that the lamps or LEDs of this device flash at the exact same frequency as the input signal. The system is considered to be up to 30 times more accurate than a high-quality electronic violin tuner or any other type of tuner on the market. The strobe tuners do come with a price tag and are often harder to use than regular items. They require skills and a fine understanding of the features of musical instruments. With so many options on the market, it may seem impossible to find the right one for you. Therefore, you need to take into account some aspects such as your budget, the type of instrument you own, and your playing skills. Purchasing the most expensive tuner on the market is not always the best solution if you won’t benefit from all its features. We suggest you take your time and try various styles, shapes, and brands of tuners until you find the one that best matches your needs. Look for the size of the display, the auto pitch detection or a product that also comes equipped with a microphone and speakers. 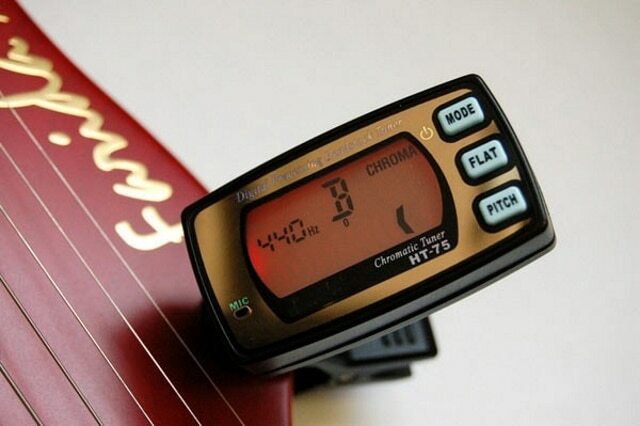 Some tuners also include a metronome, another useful tool if you’re a beginner.